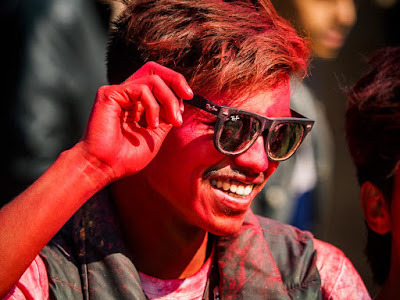 A Nepali man covered in red powder at the Holi celebration in Bhaktapur. We went to the Holi celebration in Bhaktapur during Gavin Gough's excellent workshop in Nepal. 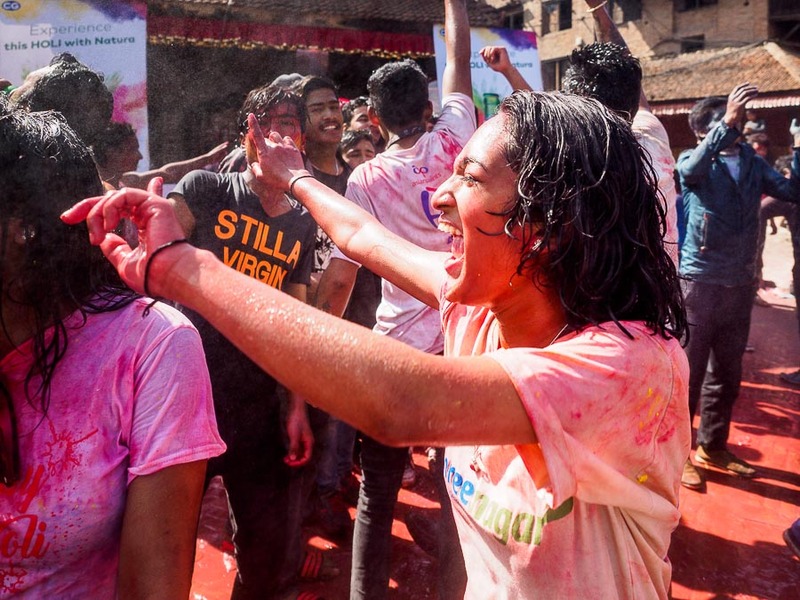 Holi is a Hindu holiday celebrating, among other things, the triumph of good over evil and the arrival of spring. 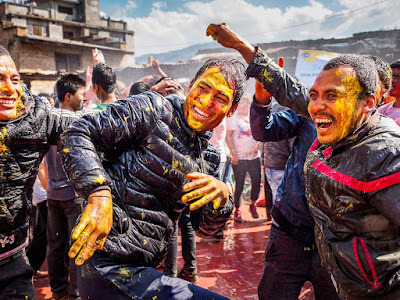 The most visible part of Holi is the joyful spreading of colorful powder, sometimes but not always mixed with water, on people. Which is how the gentlemen in the photo got his complexion. A woman in Bhaktapur's Holi "mosh pit" dances. Holi in India has gotten a well deserved reputation for rowdiness and I was expecting Nepal's celebration to be just as rowdy. Nepalese authorities, concerned about the day's increasing rowdiness, have taken a tough love approach to the holiday. Revelers aren't allowed to spray water or throw powder at people unless they get permission first, and, at least in Bhaktapur, the revelers take the restrictions seriously. 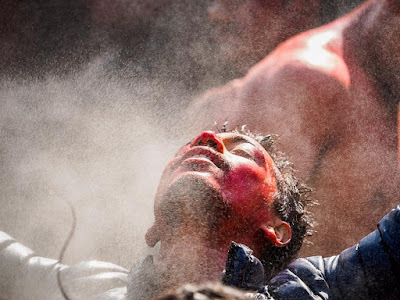 Revelers covered in red powder dance in a public square in Bhaktapur. The man in the middle is holding Nepal's distinctive flag. A man under the water spray in Bhaktapur. Everytime someone wanted to throw powder at us or spray us with water, they first politely approached and asked if it was okay. If we said okay (which we always did) then we were pelted. But it was always in good fun and the partiers made every effort to avoid our cameras and bags. It was much different from covering Songkran in Thailand. 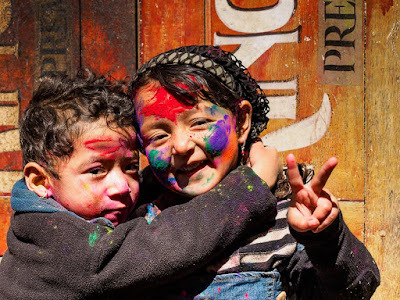 Children on their way home after a Holi party. This was my first Holi and it was a lot of fun. There are more photos of the day in my archive.